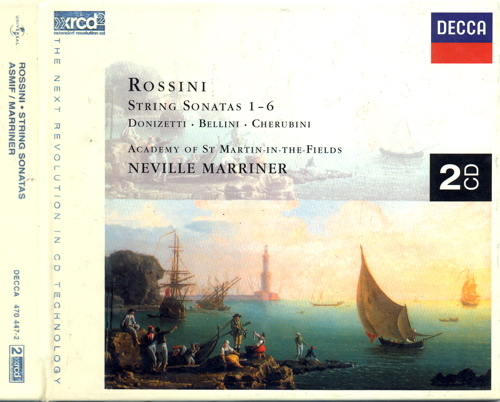 I bought this set of Rossini String Sonatas XRCDs when I first went crazy into hi-fi systems. However I very much like these recordings by Academy if St Martin-in-the-Fields, conducted by Sir Neville Marriner. I do heard from some audiophiles that the DECCA recordings by Riccardo Chailly were better with more ear-pleasing violins recording. However the Riccardo recordings may be out of print as I am not able to get hold to a set after searching for so long. Thus I am not able to make a comparison between the Riccardoand Mariner interpretation. There are a few reasons I love the Marriner recordings. 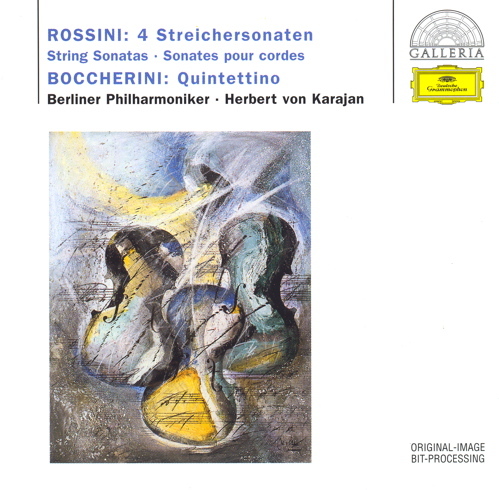 Firstly the recording is good (typical of any XRCD recordings). The Marriner interpretation was lively and youthful. Track 1 of CD1 the opening phrase was played in a youthful, naughty manner and attracted my attention the very first time. Karajan used legato for the same passage but I very much preferred Marriner's interpretation. 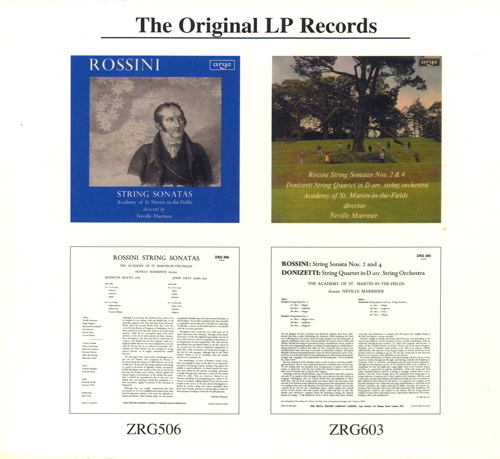 What surprise me is how Rossini at the age of 12 was able to compose such wonderful series of string sonatas. He was staying as a guest at a place where the host was a good double bass player. Not surprisingly this series of sonatas had plenty of sections with double bass solo. The sonatas were simple in musical structure. Arrangement wise there was lacking in the mid range instruments. However by no means the pieces were easy to perform. On the contrary, any below average orchestra can easily make a mess out of the music as the scores themselves demanded high technical skills from the players and the conductor. The last movement of Sonata No. 6 was written full of semi-quavers running across different instrument sections, can sounds like gust of wind. This movement is definitely challenging the limits of the players and the orchestra. Almost every movement in these series of sonatas you get solo section from the violins, the cellos and the double basses. Each movement was also short and sweet. Therefore for me I like to use them to do A/B comparison of hi-fi equipment, where you can get good coverage from low to high frequency for testing hi-fi systems. Neville Marriner used 12 violins organised into 3 groups in these recordings. Basically there were four first violins and four second violins. The remaining four violins gave support to whichever section playing the main theme. 2 Violas were added by Marriner (not in the original scores) to strength the mid range balance but no additional non-original themes were given to them. Of course to get a set of the 2-XRCD recording is expensive. The good news is I have seen normal CD edition so for those who are on a budget can still have a chance to experience the wonderful music by the young Rossini.